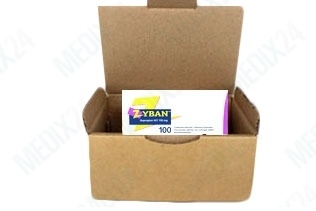 Zyban ® has been used successfully to overcome nicotine addiction for several years. Its active ingredient Bupropion is also known as an antidepressant. How can Zyban help you stop smoking? The active ingredient Bupropion, which is also known as Amfebutamon, can be used to stop smoking. Cigarette smoke contains miscellaneous harmful substances which cause negative effects in the human body. For instance the carbon monoxide cuts down the blood flow and the inhaled tar can cause cancer. In addition, the increase of messenger substances, such as dopamine and noradrenalin, is responsible for the nicotine addiction in the brain. Someone who stops smoking and deprives the body of nicotine will have withdrawal symptoms. The action mechanism of Bupropion causes an increase of dopamine and noradrenalin even during nicotine abstinence and thus it counteracts the withdrawal symptoms. But this process runs based on different mechanisms which do not involve the danger of being addictive themselves. The goal of Bupropion is aimed at leading the smoker towards a life without nicotine abuse by preventing withdrawal symptoms. During pregnancy and breastfeeding you may not take Bupropion. The appearance of adverse effects is possible but cannot be predicted since everyone reacts differently to medication. Some people are allergic to specific medication. If you notice any allergic reactions, please contact your doctor or pharmacist immediately. visual and hearing disorders (occasional) – You should contact a doctor immediately. Some people can suffer from an epileptic seizure while taking Bupropion. Therefore you should other avoid medication if its package insert also describes epileptic seizures as a possible side effect. To these belong medication against different psychological disorders, cortisone-containing compounds, medication against malaria, quinolones, antiallergics causing fatigue, pain medication which contain the active ingredient tramadol and antiasthmatics with the active ingredient theophylline. 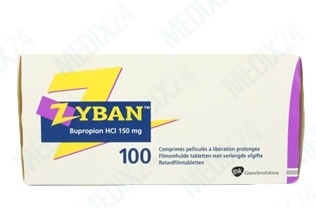 Bupropion intensifies the effects of: specific medication for the cardiovascular system (beta blockers), medication for the treatment of cardiac arrhythmias, neuroleptics and specific tricyclic antidepressants which are used for the treatment of mental disorders. Amfebutamon can affect the effects of further medication. 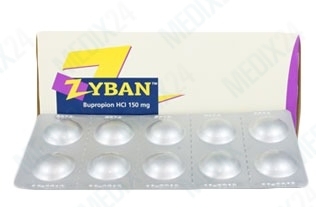 If you take any other medication, you should confer with your doctor or pharmacist before taking Zyban.